Traumatic dislocation of the radial head in the paediatric population is a well described injury, it is usually associated with an injury to the ulna in the Monteggia lesion , but can occur as an isolated injury [2,3]. Acute dislocation of the radial head with ipsilateral radial shaft fracture has been reported in adults [4-7] but never, to our knowledge, in children . We report such a case in a four and a half year old child. A four and a half year old, right hand dominant girl presented to our emergency department one hour after an injury to her right upper limb where a “Metallic Garden Ornament” fell on her right elbow, witnessed by her mother. The child was taken to theatre and an attempted closed reduction of the radial diaphysis failed, a Titanium Elastic Nailing System (TENS) nail was passed from distal radius but the fracture could not be reduced. Open reduction of the radial shaft via a Henry’s approach revealed that the proximal fragment has penetrated through the flexor muscles. The reduction of the fracture fragments was achieved and the nail was negotiated proximally. Intra-operative screening showed that the radial head was still not reduced (Fig 3 & 4) and trials of different maneuvers failed to reduce the radial head. The exposure of radial head through a separate lateral Kocher’s incision revealed a tear of the annular ligament and the anterior joint capsule with interposition of the capsule between the radial head and the capitellum. The radial head was reduced and a direct repair of the capsule and the annular ligament was done. Examination after that showed that the radial head was stable in supination durring the full arch of sagittal range of motion. The limb was immobilized in an above elbow cast in 90 degrees of flexion and full supination. After 4 weeks, the cast was removed and X-rays done showed consolidation of the fracture. The radial head was stable and gentle range of motion excercises were commenced. 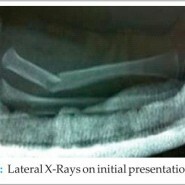 At 4 months after the surgery, the fracture was fully healed, (Fig. 5), and full range of motion was achieved. It has been explained that traumatic radial head dislocation occurs due to hyper-pronation injury with sequential disruption of the annular ligament, quadrate ligament and the interosseous membrane . A few authors have reported ipsilateral radial shaft fracture with radial head dislocation in adults [4,5] and thought that the fracture preceded the dislocation. 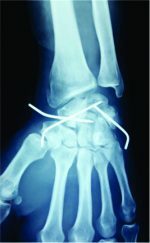 A similar case has been reported with a clear mechanism of injury of a fall on a pronated forearm and thus postulated that the dislocation happened first and a lateral or supinating deforming force would have caused the radial diaphyseal fracture at the most distal level of interosseous membrane injury . Congenital dislocation of the radial head could have been a possible explanation for this type of injury in children  but In this patient, the contra-lateral side was normal and the intra-operative findings of haemarthrosis and damage to the soft tissue complex suggest an acute injury rather than congenital. Up to our knowledge, this is the first reported case of such an unusual complex injury in a child. 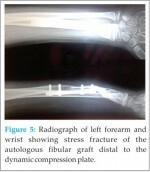 A good clinical outcome was achieved by applying the principles of management of proximal forearm fracture-dislocation. 1. Bado JL. The Monteggia lesion: Clin Orthop 1967; 50: 71. 2. Lloyd-Roberts G.C and Bucknill T.M. : Anterior dislocation of the radial head in children. J. Bone Joint Surg. 59B:402, 1977. 3. Ryu J, Pascal PE and Levine J: Posterior dislocation of the radial head without fracture of the ulna: case report. Clin Orthop 1984;183: 169. 4. Simpson JM, Andreshak TG, Patel A, Jackson WT: Ipsilateral radial head dislocation and radial shaft fracture: a case report. Clin Orthop 1991;266:205. 5. Mehara AK and Bhan S: Ipsilateral radial head dislocation and radial shaft fracture: a case report. J. Trauma 1993; 35: 958. 6. Haddad FS, Mantelow AR, Dorrell JH :Radial head dislocation with radial shaft fracture. Injury 1995;26: 502-503. 7. 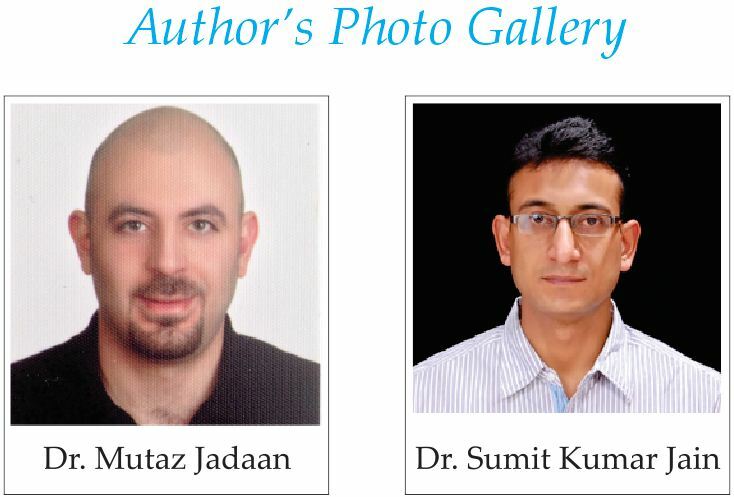 Cherif MR, Chehimi A, Ben Ghozlen R, Mbarek M: Traumatic dislocation of the radial head associated with Ipsilateral fracture of the radial shaft: A case report. Acta Orthopaedica Belgica, Vol. 68 – 5 – 2002. 8. Lee CT : Fracture of the shaft of the radius and dislocation of ipsilateral radial head in children. Beware of rare injuries. Injury, 1998, 29, 791-792. 9. 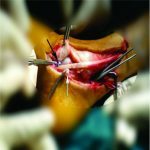 Gleason TF, Goldstein WM: Traumatic recurrent posterior dislocation of the radial head: a case report. Clin Orthop 1984;184: 186. 10. Miura T. Congenital dislocation of the radial head. Journal of Hand Surgery 1990; 15: 477-481. 11. Spinner M and Kaplan EB. The quadrate ligament of the elbow- its relationship to the stability of the proximal radioulnar joint. Acta Orthop Scand. 1970; 41: 632. 12. Salama M, Weinstraub S and Weissman SL. Recurrent dislocation of the head of the radius. Clin Orthop 1977; 125: 156.